Description- The facilitator should reach out to interested persons to begin the formation of an informal SRTS taskforce for the school. The taskforce should include members of the local advisory committee, parents, teachers, school administration, and local residents. Description: The school, through the SRTS Taskforce, should work with the Town of Lloyd to seek written permission to install a school speed zone on the recommended roadway segments. After this approval is granted, high-visibility fluorescent yellow green signs designating the school zone and school zone speed should be installed. Police enforcement and temporary radar trailers can also be used to promote and enforce the new speed limit. Description: International Walk to School Day is held annually on the first Wednesday in October. This event can serve as a kick-off event to generate awareness and enthusiasm for a Safe Routes to School program. Events may include a special Walking School Bus lead by local politicians or school administrators, school assembly, and contest. Schools may find additional information and register for the event at www.walktoschool.org. Events such as these tend to attract increased attention and excitement that can be tapped to attract volunteers to maintain efforts year-round. Description: Sign and install shared lane markings on Main Street. Implement the bicycle boulevard on Elting Place and Commercial Avenue (signage, pavement markings, and traffic calming). Install the sidewalk segment on Commercial Avenue Extension and the crosswalk to the HVRT. 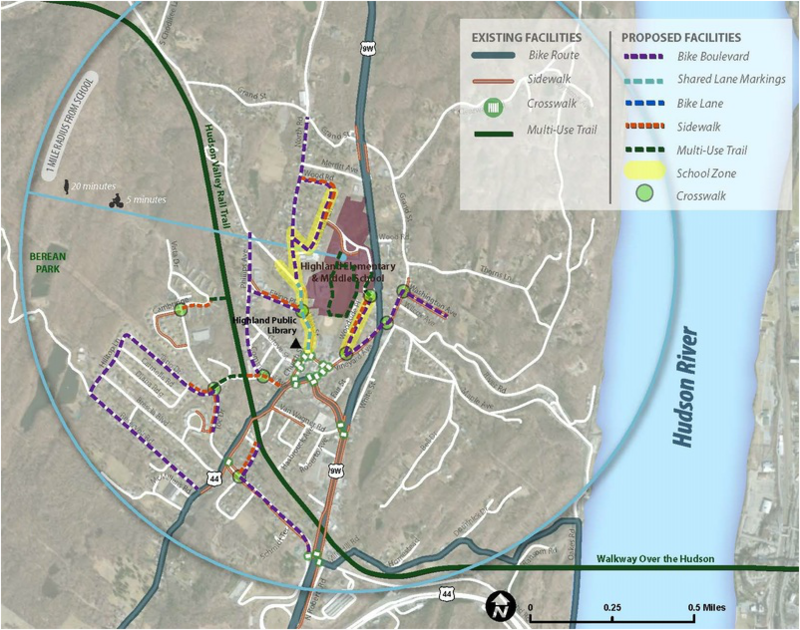 This improvement would be an early win for neighborhoods to be able to connect to the school and provide a designated walking and bicycling route to the HVRT from the School. Description: Construct a shared use path along the slope behind the middle school and to the southeast of the elementary school playground to connect the Middle School to the Elementary School. This is important access for emergency evacuations of either school and also allows students to walk between Main Street and Lockhart Lane without walking in the roadway. Description: Purchase and install bike racks at each school, located near the entrance in a secure and visible location. Underneath an overhang or some other type of roof structure would be beneficial. Description: Stripe the sidepath on the driveway, install bollards and mirror. 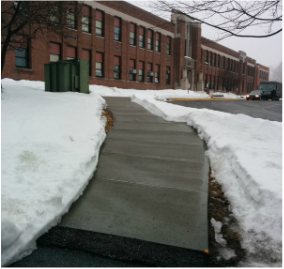 Complete the sidewalk gap between the school driveway and the existing sidewalk. Install traffic calming measures, signage and pavement markings for bicycle boulevard. Install high visibility crosswalks at the school driveway and the intersection of Vineyard Avenue and Woodside Place.